In this post, we are sharing a reply of PGPortal Grievance filed by one of QMaths Followers to CBEC to know if CBEC has received any information from SSC to start joining Process, for which reply was negative. You may view the image or text below for information. 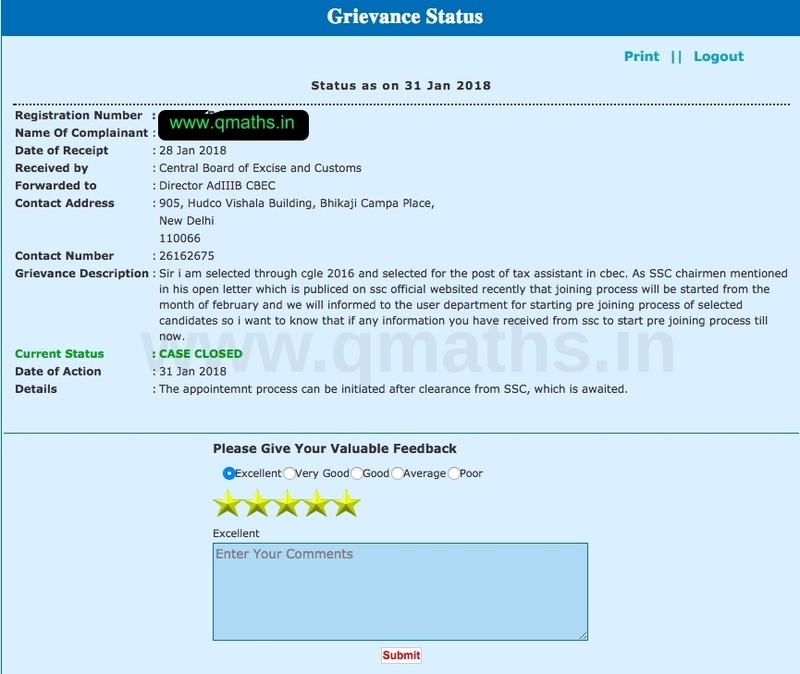 Grievance Description : Sir i am selected through cgle 2016 and selected for the post of tax assistant in cbec. As SSC chairmen mentioned in his open letter which is publiced on ssc official websited recently that joining process will be started from the month of february and we will informed to the user department for starting pre joining process of selected candidates so i want to know that if any information you have received from ssc to start pre joining process till now. Details : The appointemnt process can be initiated after clearance from SSC, which is awaited.